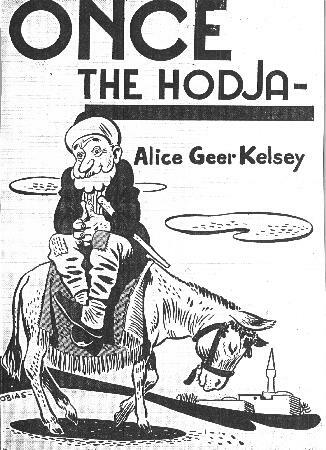 Once the Hodja is a book of Hodja stories written by Alice Geer Kelsey, illustrated by Frank Dobias, published by David McKay Company Inc, New York (first edition 1943). Mrs. Kelsey writes in her acknowledgements: "Apologies go to the many people who could have written the Hodja stories better than I. My only excuse is that I spent nearly twenty years saying `Someone ought to write the Nasr-ed-Din Hodja stories for American boys and girls,' before I decided that I would have to do it myself." I feel it is a terrible shame that Mrs. Kelsey's wonderful rendition of classic Hodja stories - one of the first in the English language - has already been long out of print, and so I have posted the stories here, which I think would be in accordance with the author's wishes. Thanks to Sara Shnider for lending me her copy of Once the Hodja. Five centuries ago, so runs the tale, a Turkish schoolmaster was berating a group of his pupi1s for a prank. One by one he called them to him to ask what part each had had in the mischief. Solemnly he pronounced a punishment to fit each crime. At last came the turn of a particularly lively pupil, Nasr-ed-Din. "And what did you do?" demanded the schoolmaster. "Nothing." Nasr-ed-Din shrugged. "All I did was to watch and laugh." The schoolmaster pondered a moment and hit upon the perfect punishment for one who merely watched and laughed. "As long as the world lasts, people will laugh at you!" For five centuries the people of Turkey, and of all the Near East, have been laughing at Nasr-ed-Din - and still they laugh. The humorous folklore of the nation has been hung upon the name of Nasr-ed-Din, who, on becoming a teacher-priest, added the honorary title of Hodja to his name. Young and old, rich and poor, ignorant and learned, break into a grin of anticipation whenever they hear, "That reminds me of a Nasr-ed-Din Hodja story!" There are hundreds of these stories. In many of them the Hodja's patient, long-eared donkey has a part, for the Hodja, like the Turkish villager of today, has one friend upon whom he can depend - his donkey. Some of these stories are thought to be real happenings. Nobody knows, and nobody cares, which are history and which are legend. It is known that at the time of Tamerlane the Great there was at Ak Shehir in Turkey a rustic teacher-priest called who had a talent for being very foolish as he did wise things and being very wise as he did foolish things. Even at his grave the people laugh, for his is no ordinary grave. It stands on a hill near Ak Shehir. It is marked by a single iron gate, carefully locked, but without accompanying walls. Nasr-ed-Din Hodja is as Turkish as Paul Bunyan is American, but the Hodja carries the accumulated humor of five centuries instead of one. Anyone who would really know the Turk in his jovial mood can learn what he is like by laughing with him at his loved figure, Nasr-ed-Din Hodja. We thank the missionaries of Merzifoun, Turkey, for introducing us to the Nasr-ed-Din Hodja cycle of Turkish folklore. Dr. and Mrs. George E. White, Rev. and Mrs. Dana K. Getchell, Dr. and Mrs. Jesse K. Marden, the Rev. and Mrs. Ernest Pye, Mr. and Mrs. Theodore Riggs, Bertha Morley, Fanny Noyes, Mary Ward, Charlotte Willard, and Emma Zbinden loved Turkish folkways and Turkish folklore. They passed the love of them on to some of us who went to Merzifoun in 1919 to do relief work. We might have forgotten the Hodja had he not followed us to America when some of our Merzifoun orphans grew to college age and made their headquarters with us while studying here. Haig Baronian, Charalambos Stephanides, Demetrius Photiades, and Charalambos Panayotides entertained our four children with the tales about Nasr-ed-Din Hodja. Enjoying these stories with our children, we became avid Hodja fans and begged for Hodja stories whenever we had visitors from the Near East. Among the students, missionaries, and welfare workers who have added to our stock of Hodja stories are Jeanette Odell, Merrill Isely, Paul Nilsen, Nevzat Jemal, Herman Kreider, and Ralph Allee. We have compared these stories as told us with those in the German collection by Ali Noun and in the translation of the Hodja stories into English by Henry D. Barnham. Special gratitude goes to the Rev. and Mrs. Ernest Pye for reading the manuscript. From their background of first-hand knowledge of the Near East, they were able to correct inaccuracies and add bits of local color. Apologies go to the many people who could have written the Hodja stories better than I. My only excuse is that I spent nearly twenty years saying, "Someone ought to write the Nasr-ed-Din Hodja stories for American boys and girls," before I decided that I would have to do it myself. Once the Hodja bears a dedication "To Paul, Edith, Olive and Martha." WITH the appearance of Once the Hodja a new folk character is introduced to American children. He comes from Turkey where Turks of all ages love to hear and tell stories of him. A simple kindly country fellow, with a talent for getting into trouble, he has even greater talent for getting out. Bait for small boys and grown men-alike, the Hodja almost always, but not quite always, turns the table on those who would make a scapegoat of him. Seldom has a more genuinely humorous and appealing folk character been presented. Most countries have some character on which to hang funny stories and Turkey has Nasr-ed-Din Hodja. The historical Hodja lived about five centuries ago, but the legendary hero is very much alive today. Out of a living knowledge of Turkey and a warm affection and sympathy for the Hodja himself have come this delightful collection of folktales. For this volume Alice Geer Kelsey has selected from the hundreds of stories about the Hodja those that have the most spontaneity and humor - that have stood the test of telling and retelling and she has woven them into a background that makes the reader at home in mosque, public bath, market place, vineyard or the Hodja's home. Like the author, Frank Dobias has lived in Turkey. His illustrations have caught the lively, contagious, laughing spirit of the Hodja stories. ALICE GEER KELSEY was born in Danvers, Massachusetts. Her pre school yearl were spent in Lewiston, Maine, and in West Hartford, Connecticut. She graduated from Mount Holyoke College in 1918. In 1919 she married Lincoln David Kelsey and left America, as a bride, on the second boat taking relief workers to the Near East after World War I. She worked with war orphans at Merzifoun. and her husband did agricultural and general relief. A fine collection of Turkish stories - Once the Hodja -was gathered during this time - stories well-known to all who have lived in the Near East. In 1928 her husband joined the staff of Cornell University and the Kelseys have lived since then in Ithaca with time out for Mrs. Kelsey to serve with UNRRA in Athens, while her husband's skill was again called on in agricultural problems. The Kelseys spend their vacations on an island in a pond in the mountains, a four-mile canoe trip from the mainland storing up "serenity enough to last them through another year." The author has used a phonetic spelling nearest approximating the Turkish sounds. Most laudable; a name often given Turkish boys. White City; a city in Asia Minor. Arabic name for the Deity. God is great. The first words of the Moslem call to prayer. Title for civil functionaries and any person of distinction. Meat and rice cooked in tomatoes, green peppers, grape or cabbage leaves. Title applied to persons of scholastic or official rank. Also a term of courtesy among equals. Turkish money. In paper currency equal to less than one cent American money. In gold currency it is equal to 4.4 cents. The director of a public bath. A name often given to boys. Your coming gives joy; welcome. If God is willing; I hope so. A boy's name, meaning "praiseworthy." An expression used after praise or good luck to ward away the evil eye. 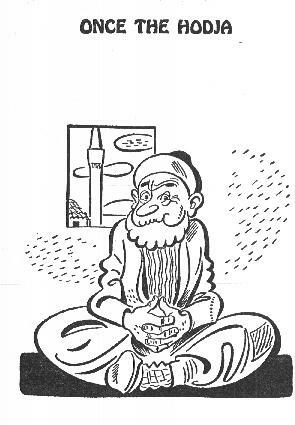 Priest who gives call to prayer from minaret. Boy's name meaning "favored of religion." Divine worship in Islam, including recitals of praise with prostrations of the body. Rice or wheat cooked in meat or vegetable broth. Turkish delight, a candy similar to gum drops. "And unto you be peace," the reply by a Moslem to the greeting of another in the faith.